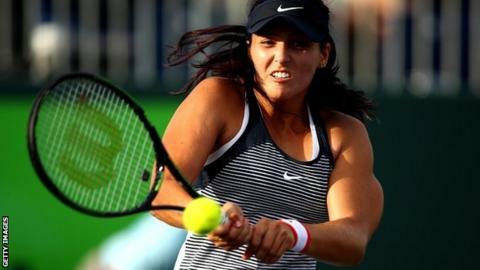 Laura Robson won her first match in the main draw of a WTA tournament since 2013 as she beat Morocco's Ghita Benhadi at the Rabat Open. Robson, 22, broke serve six times on her way to beating the 18-year-old wild card 6-1 6-1 on the clay. The Briton's last WTA main draw win came in September 2013, before a wrist injury required surgery and put her out of action for 17 months. Robson will play Hungarian fifth seed Timea Babos in the second round. The former British number one is currently ranked 426th and has lost WTA first-round matches in Indian Wells, Miami and Charleston this year. She beat world number 117 Klara Koukalova in Stuttgart last week but then lost in the final round of qualifying.